A glossy card in a postcard format which includes a description of the image on the back as well as space for writing. 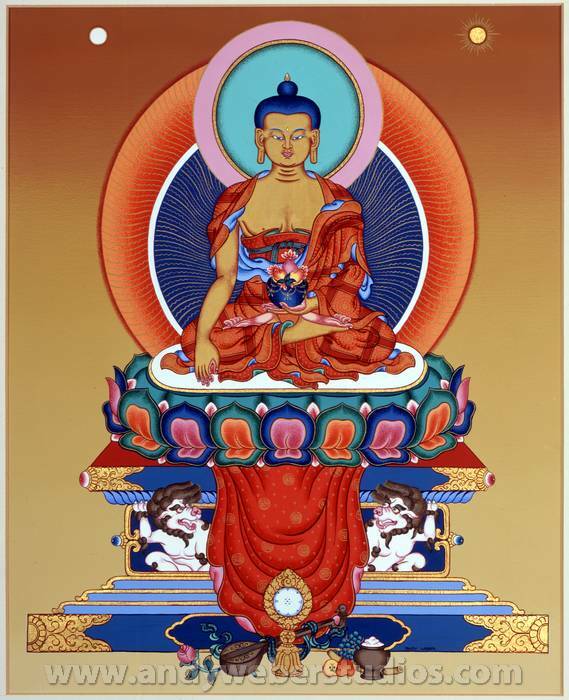 The teacher of Buddhism in this world age and the principle image of refuge and devotion for all Buddhists is depicted on a throne supported by snowlions, the mystical animals of the Himalayas. He is sitting on three objects: a lotus, sun and moon seat. The lotus represents renouncement of worldly attachment, the sun symbolizes wisdom and the moon bodhicitta, which increases like the moon from loving kindness to the wish to reach enlightenment for the benefit of all beings. The disks behind his head and body represent auras – light spheres. In his left hand he cradles an alms bowl filled with long life nectar and three fruits, antidotes to the three root delusions: ignorance, desire and anger. His right hand is in the earth – touching gesture, which stems from the moment when he called upon the earth to bear witness to his enlightenment.